However, in the field of early keyboard instruments it doesn’t seem to be a problem. The Colt Clavier collection of keyboard instruments offered at Canterbury Auction Galleries (24% buyer’s premium) on June 7 attracted bids from across Europe, the US, China, Korea and Australia. While bidding tended to be around – and sometimes below – estimates, 94% of the 135 instruments got away in the 187-lot sale which totalled £716,000. And that is on top of the £166,000 hammer taken for five pieces from the collection sold by Bedford specialist Piano Auctions in London last April. That sale included a c.1821 inlaid rosewood grand piano by Thomas Tomkison, piano maker to George IV. It was provenanced back to the Regent’s Brighton Pavilion and went back there after selling at £62,000 (plus 20% buyer’s premium). Piano Auctions had lent its expertise in a link-up with Canterbury Auction Galleries to handle this latest dispersal of the Colt Clavier Collection. It followed Gardiner Houlgate’s sale of the Christopher Hogwood collection in March 2015 (ATG No 2184) and the Finchcocks Museum collection sold at Dreweatts in May 2016 (ATG No 2243), but Richard Reason, co-owner of Piano Auctions, was confident that the Canterbury offering would also do well. 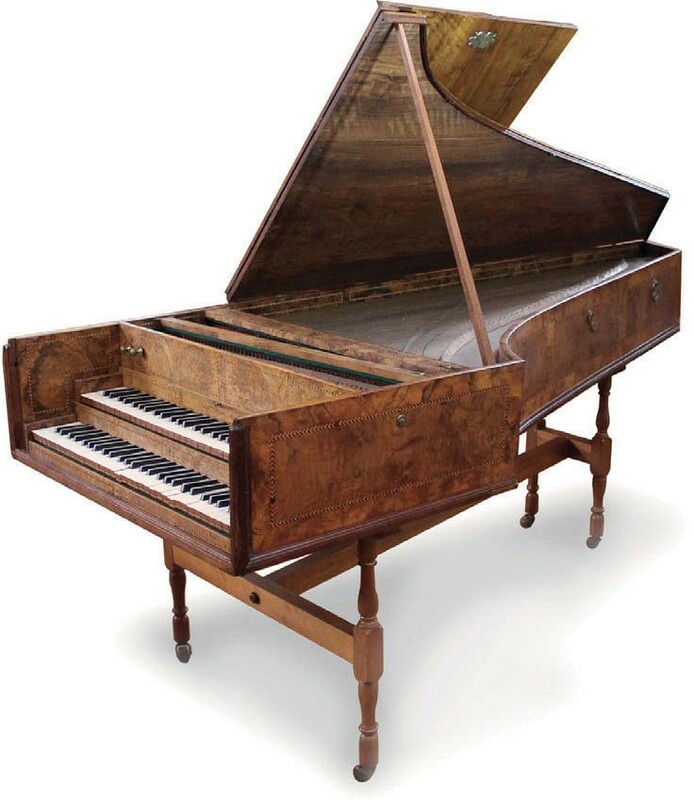 So it proved at Canterbury where the top-seller was a 1738 walnut-cased double-manual harpsichord by London maker Joseph Mahoon (fl.1729-73), possibly the only one of its type by the maker to the king to have survived. Estimated at £40,000-60,000, it sold to an American bidder at £69,000. Mahoon also made much sought-after bentside spinnets, 13 of which are known to exist – including one at the Horniman Museum in south London. The c.1740 walnut-cased example from the Colt Clavier Collection sold comfortably above hopes at £10,800. The same American buyer paid a lower-estimate £40,000 to take a similar instrument in a mahogany and line-inlaid case with a maker’s plaque: Burkat Shudi et Johannes Broadwood Patent No 1137, Londini Fecerunt 1790 Great Pulteney Street Golden Square. The age of the harpsichord had begun to close with the introduction of square pianos in 1760. These were not cheap at around £18 each (say £3500 today) but were, nevertheless, half the price of a harpsichord. They received the seal of approval from composers such as Gluck and JC Bach and society leaders, from Queen Charlotte in England and Catherine the Great in Russia to George Washington and Thomas Jefferson in America. It was the purchase of a George IV Broadwood square piano for £6 in 1942 which began Charles Colt’s passion. Then came a harpsichord, then an early grand piano. He kept on buying until at one point he owned more than 130 instruments. The heir to the family firm which built timber housing, Colt (1911-85) chose to house the collection in the ‘village hall’ and other buildings at Bethersden, Kent, which was erected to demonstrate company products. Colt never lost his affection for the square piano and 28 were on offer at Canterbury, ranging in price from a few hundred pounds to four figures. 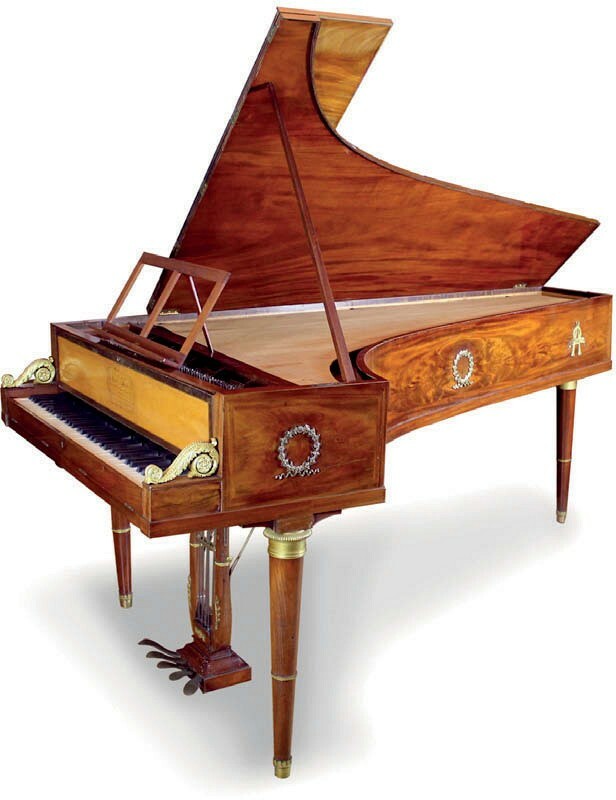 The more costly ones generally sold around low estimates, including a rosewood-cased example by Clementi, London 1823, at £8000, and one by Pape, Paris 1834, with a birch case crossbanded in purplewood, which sold at £4200. 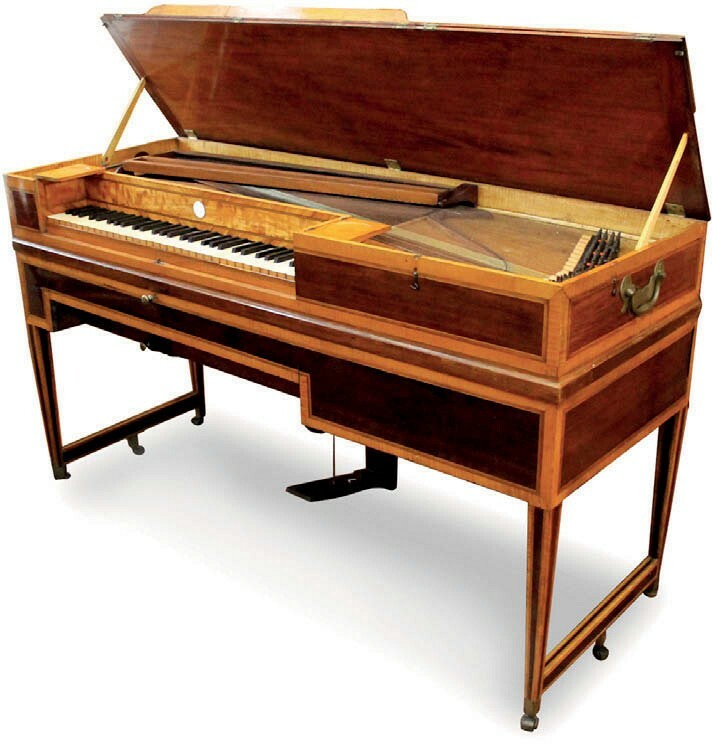 One was a Clavecin Royal – a large German five-octave square piano with a different hammer action to the better-known English design. Made by an anonymous German maker in c.1785, the oak case featured a later crossbanded lid decorated with an inner painting depicting Glenarm Castle in County Antrim. Estimated at £3000-5000, it sold to a Surrey buyer for £18,500. The other surprise was a double-action square piano with mahogany panelled case with quarter round gilt metal moulding and a satinwood crossbanded maple nameboard, inscribed Erard Freres, Rue Du Mail N.37. à Paris 1804. Estimated at £1200-1800, it sold at £10,000. Square pianos, the instrument of choice between the years of the harpsichord and the coming of the pianoforte, can make five-figure sums – but most examples can be bought for three-figure sums. Depending on condition (many are prone to all the aging problems inherent to all-wood instruments) this is even true of works by major period names, including the royal maker Thomas Tomkison. 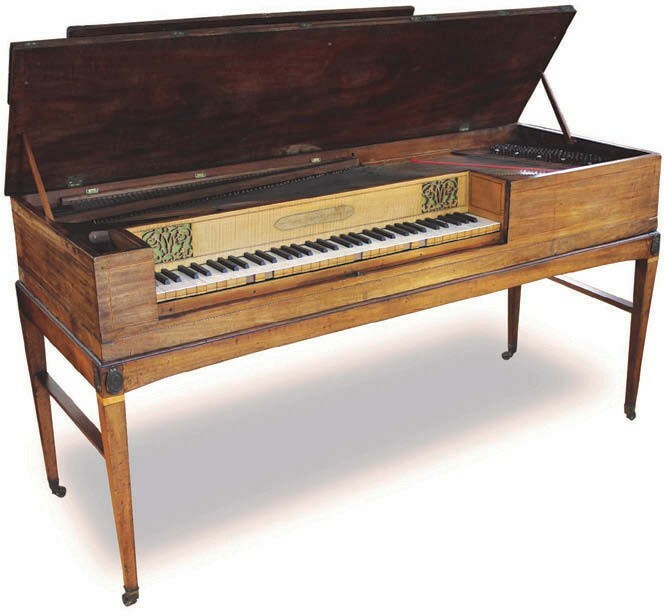 The c.1805 example here, with a mahogany case line inlaid with ebony and boxwood, bore a paper label: Grand and square, Thos Tomkison Piano Forte, Dean Street ,Soho, London, Manufacturer. Pitched at £300-500, it sold at £620. By the first quarter of the 19th century, square pianos were becoming obsolete, many converted to desks and dressing tables as the pianoforte emerged as the keyboard instrument of choice. The ubiquitous wooden-framed upright was part of every home and has little collectable value. However, Victorian and earlier grand pianos command specialist interest. Erard is the top name. Made 14 years after the £10,000 square piano, a mahogany-cased, maple-veneered and rosewood crossbanded grand was inscribed to the fall board: Par Brevet d’Invention No. Erard Frères. Facteur de Forteé-Piano & Harpes du Roi, de ses mènus plaisirs, & de la Cour ImpÈriale de Russie. Rue du Mail No. 13 & 21 ‡ Paris 1818. It sold to a phone bidder in Amsterdam at £26,000 against an estimate of £10,000-15,000. Different Dutch buyers played their part in the day’s success. One bought a c.1816 grand in a walnut veneered case by Louis Dulcken, Munich, at a lower-estimate £20,000. A second bought a c.1805 grand by MA Stein, Vienna, c.1805, which had a cherry case stained to simulate rosewood. At £16,000, this sold below estimate. Another grand with a stained cherry case, catalogued as school of Stein, probably south German, c.1785, was one of the day’s disappointments when it was unsold against hopes of £40,000-50,000. With 28 various instruments by the prolific company Broadwood on offer, buyers could be choosy. Two of the most interesting pieces went below expectations. One was a rosewood cased grand which had been delivered to George IV at the Brighton Pavilion in 1821, taken to Windsor Castle in 1827 and, presumably, went into private hands at some point before it was bought by Colt during the war for £10. It sold to a Kent buyer at £20,000. The other was the second earliest Broadwood piano known. With the serial number 208, this mahogany cased grand inlaid with boxwood stringing was inscribed to the nameboard: Johannes Broadwood Londini Fecit 1787. Great Pulteney Street Golden Square. In sufficiently good condition to have been recorded for the BBC sound archives, it sold to an American bidder over the phone below hopes at £16,000. Merlin claviorganum, 1784 – £20,000. 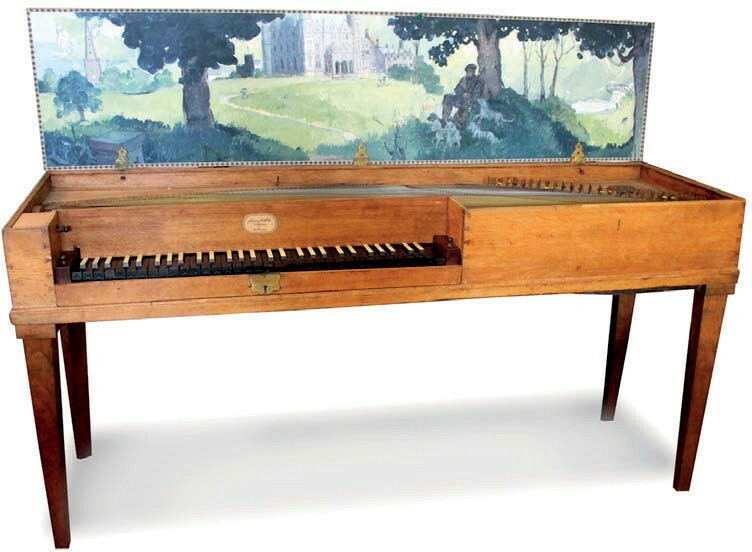 Selling on top estimate, however, was one of those oddities 18th century makers tried out on the market: a combination of a stringed keyboard instrument and an organ known as a claviorganum. Dated 1784 in a mahogany case cross-banded with satinwood and inlaid with fruitwood stringing, it was inscribed to an enamel plaque: Merlin, of Princes Street, Hanover Square. John Joseph Merlin was famed for his ingenuity, although his instruments only ever seemed to enjoy passing fashion. At Canterbury his claviorganum was guided at £15,000-20,000 and sold to a French buyer via thesaleroom.com.